Having grown up in the 1970s, I can tell you it was a vastly different country then. It was free. But we aren’t any no longer, and it is time we took back what is ours — our unalienable freedoms. Shadow banning (also called stealth or ghost banning) is the act of blocking or partially blocking a user or their content from an online community such that it will not be readily apparent to the user that they have been banned. As such, shadow banning is a form of sneaky censorship. Whatfinger News was founded by military people and 100% unapologetic for being patriotic. That doesn’t mean we don’t show opposing views, sites and papers. We do and label them on the homepage in sections as right wing or left wing, unlike other sites that might trick you into clicking into sites that you would never want to visit. Not us! 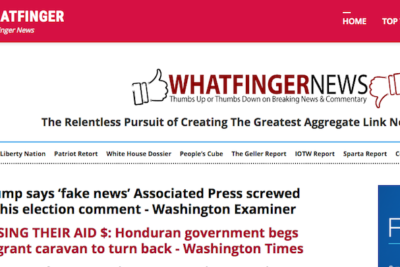 FOTM‘s readers have seen our promotion of Whatfinger at the bottom of our posts. Even before we started doing that, Whatfinger had posted links to our posts, which was how I discovered Whatfinger. Each day, we get hundreds and often thousands of referrals from Whatfinger, for which FOTM is most grateful. So I went on Whatfinger to find out what had happened. Many sites have now sent screenshots, sites that we send thousands of people to daily who are all noticing WordPress ‘shadowbanning of stats’ – we all now need to know the truth. Are all conservative sites targets? Will they blame some ‘algorithm as Facebook likes to do? Can’t be just Whatfinger, since we are new and no where near the size of other sites just yet. So I went to FOTM‘s stats page, only to discover that WordPress had changed the referrals of the day before, Oct. 11, to remove all referrals from Whatfinger! The problem is, a day before, I had seen thousands of referrals from Whatfiinger, which now had vanished, retroactively expunged by WordPress….